The 2019 NFL Draft still remains many months away but that doesn't mean the long process hasn't begun. Every NFL team in the league has taken long looks at prospects across college football, and many teams are already waiting for their time on the clock. Expect plenty to change between now and the spring, but as things stand in early December, here is just how the 2019 NFL Draft may shape up. Following in the footsteps of his older brother Joey, a former high first-round Draft selection himself, Nick Bosa has asserted himself as a dominant pass rusher with limitless potential. Even in a Draft filled with superb pass rushers, Bosa appears to be the top on the board with an explosive first step and incredible motor. He will immediately upgrade an Oakland pass rush that has been nearly nonexistent since the Khalil Mack trade. Prior to 2018, Quinnen Williams entered the year without a lot of snaps under his belt but he has quickly evolved into one of the best defenders in the entire country. Williams' ability to play both end and on the inside, paired with his impressive size will make him a high profile NFL prospect throughout this process. San Francisco could use another impact defender in their defensive front, and turning to the Tide linemen will be in their best interest. The run on defensive linemen continues with Ed Oliver, who has been an impact defender with Houston since the first day he stepped on campus. Oliver is another playmaker that brings impressive versatility, size and potential to the table even though he dealt with injuries for a decent chunk of 2018. Arizona is yet another team that needs help up front defensively, and Oliver is a superb consolation prize. Sam Darnold has had a wildly inconsistent rookie season, but he has had to make do with a Jets' offense that lacks proven weapons. New York could remedy this issue by selecting explosive Arizona State wide out N'Keal Harry. Harry doesn't have ideal NFL size, but he can open up any games with his speed and can also support on special teams if need be. Jacksonville needs a quarterback, but Doug Marrone nor Tom Coughlin really seem interested in a rookie at that spot and a trade or free agent signing of a veteran seems much more likely. The Jaguars will instead turn to their offensive line, which has struggled for much of this season. There isn't a clear top offensive line prospect in this class, but the athletic and reliable Greg Little will be just fine. After over a decade of Eli Manning, it appears time for the New York Giants to move on at the quarterback position. This is not a great quarterback class, but in a down year for the position, Oregon's Justin Herbert will be more than enough. Herbert still needs to improve his accuracy, but he already has NFL arm strength and should be a good fit in Pat Shurmur's offense. Obtaining a franchise left tackle should be top on Buffalo's priority list if they want to continue to build around Josh Allen at QB. Their offensive line has been inconsistent all season, and Allen needs all the help he can get. Williams has been a starter at Alabama since his true freshman season, and has all the talent to be a Top 10 selection. Could Tampa Bay move on from the Jameis Winston era and select a quarterback in the first round? Perhaps, but the more pressing need lies at cornerback, as Tampa has been scorched all season by the passing attack. In a division with Cam Newton, Drew Brees and Matt Ryan, Tampa needs all the help they can get, which is where Williams comes in. A ball-hawking corner out of LSU, Williams would be a great move here. The Lions need plenty of help on their mediocre defense, including the D-Line, linebackers and their secondary. Linebackers seems the most likely, considering how thin and old they are the position. One of the rangiest defenders in college football, White is the type of player that would work wonders for this Detroit team. Cleveland already has a strong defensive front, but adding yet another pass rusher to the mix could really put them over the top. Derrick Brown doesn't get as much attention as other pass rushers in this class, but he proved to be extremely productive while at Auburn and he has the potential to be an extremely productive weapon for the Browns. Many scouts view Josh Allen as a Top 5 talent in this Draft, but there is a good chance one of the top defensive players in this class drop. If thats the case, Green Bay won't hesitate to select Allen, who would be an excellent fit as a standup linebacker in the Packers' 3-4 defensive look. Allen has been pivotal in UK's surprising 2018 season. While their offense can compete with anybody in the country, Atlanta has consistently struggled to stop opponents from doing the same. They need to get more pressure on the quarterback and luckily, there are an abundance of options at this spot. 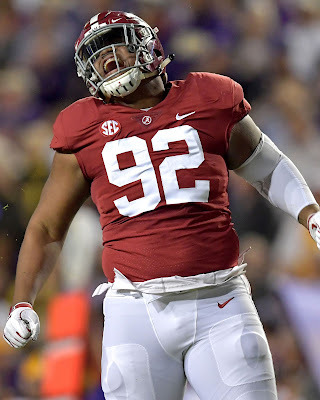 Alabama's Raekwon Davis may be the best option on the board, as the physical linemen has proven he can consistently wreak havoc in opposing backfields. Cincinnati is another team that could use pass rushing help immediately, and they should be able to take advantage of the plethora of options in this Draft. Jeffery Simmons has Top 10-level talent, but a video of him hitting a woman prior to arrival at Mississippi State still hangs over him, and rightfully so. The Bengals have been a franchise willing to take chances on guys with questionable pasts, and Simmons fits the mold. The run on defensive linemen continues here for Miami, a team looking for interior help after releasing Ndamukong Suh this past off-season. All four of Clemson's defensive linemen should be high Draft selections, but Wilkins should be the first off the board. He has been an impact player since being a true freshman, and brings excellent versatility and athleticism. Even with their recent acquiring of cornerback Malcolm Butler, Tennessee's pass defense was struggled for much of 2018. There is hope Butler and company can return to form, but the most likely solution is to select a young defensive back. DeAndre Baker proved himself as a shutdown corner during his tenure with Georgia, and he could immediately be an upgrade. After a breakout 2018, Dwayne Haskins should take advantage of his rising stock and go to the pros. He still has things he will need to work on, but his arm talent and pocket presence should be enough to earn him a first-round selection. Denver could desperately use a fresh signal-caller to develop, and Haskins is a worthy move right here. Playing on a defense that is loaded with future NFL talent, Trayvon Mullen often gets ignored at Clemson. Yet, the physical corner has the athleticism and football acumen to be well worthy of a first-round selection. He would immediately upgrade a Carolina defense that has really struggled to defend the pass ever since Josh Norman left for Washington. It has been a disappointing season just a few months removed of a Super Bowl Title, but Philadelphia still has one of the most complete rosters in football. However, they could get even better by upgrading their pass rush and defensive front. Look no further than yet another Clemson prospect, tackle Dexter Lawrence. Lawrence isn't an elite pass rusher, but he is superb in run support and has loads of potential. A devastating injury to Alex Smith a few weeks ago opened up Washington's eyes to just how thin they are at the quarterback spot. Even if Smith is able to come back healthy, he is aging and has never been the type of player that can put a team over the top. Its time for the Redskins to start anew at the position, and Drew Lock is the best on the board. He has an incredible arm that could really open up this offense. A healthy Andrew Luck has worked wonders for the Colts, who find themselves in the Playoff hunt despite some significant holes on this roster. While Luck has been superb, he needs more help from a mediocre group of receivers. T.Y. Hilton is still a factor but he is getting older and there isn't much beyond him. Indianapolis turns to A.J. Brown here, a playmaker with a huge frame who could easily be the top wide out on the board this next spring. While their pass defense has still been solid in 2018, there is significant age on the back-end. Baltimore should remedy this issue by adding Alabama safety Deionte Thompson, who is the type of prospect that will shoot up boards as the process continues. Thompson is incredibly rangy and should be able to make the plays some of the aging guys aren't able to. The Vikings have one of the worst rushing attacks in the NFL and much of it can be blamed on an offensive line that can't get any push. They need to address the line right away in this Draft, and Oklahoma product Ben Powers would be a huge help. Powers has been crucial in the success of Baker Mayfield and Kyler Murray, and should open up massive lanes for Dalvin Cook to work with. Many people point to the break-up of the Legion of the Boom as the main reason for Seattle's lack of defensive success in 2018, but the D-Line has also lost important contributors and lacks a premier pass rusher. Selecting Clelin Ferrell here would be a huge move to add some much-needed bite to the front seven. Ferrell is a sack machine who could easily go as high as the Top 10. Already adding Nick Bosa earlier, the Raiders continue to improve their defensive front by adding the top Draft prospect from his rival school. Rashan Gary, formerly the No. 1 recruit in the country, has had issues with injuries but possesses undeniable talent. Learning under Jon Gruden could unlock all of Gary's vast potential. After stocking up defensively, Oakland uses their third first-round selection on the other side of the ball here. Amari Cooper is gone, opening the door for a new No. 1 guy to step up for the Raiders, who should look no further than Marquise "Hollywood" Brown here. Brown is an absolute blazer that can change games every time he touches the ball. Paired with Derek Carr's huge arm, Brown will be a home run threat from the first snap. Los Angeles has been one of the most pleasant surprises of the 2018 campaign, but they have been inconsistent against the run all season, and that needs to change if they want to get over the top. Zach Allen is yet another guy that can play inside or outside, and produce at either spot. He is an absolute beast, and maybe the most underrated prospect in this Draft. The latest in a long line of star inside linebackers from Alabama, Mack Wilson is a terrific NFL prospect. He has great range, is superb as a coverage 'backer and is one of the hardest hitters in the entire country. Pittsburgh's linebacker corps still misses Ryan Shazier, so selecting Wilson here makes sense. There shouldn't be much of a question which direction Houston should go with their first pick: offensive line. The O-Line has been absolutely terrible for all of 2018, and there is no hope Deshaun Watson takes a step forward without some help. Dalton Risner has been a crucial leader for Kansas State over the years, and he is the well-rounded prospect Houston needs. No quarterback of the future here for New England, but instead a tight end of the future. Rob Gronkowski has made possible retirement plans well-known and injuries have crippled his time with the Patriots. Noah Fant is one of the most consistent tight ends in the nation, and while he doesn't have Gronk's size, he has a little more speed and shiftiness. Jordy Nelson is gone, and it looks as though Randall Cobb may soon be out as well in Green Bay. As Aaron Rodgers career begins to slowly start slowing down, he is going to need a toy to play with in this offense. The Packers shouldn't hesitate to add Parris Campbell out of Ohio State. Campbell is a big play waiting to happen, and he was perhaps the most dominant player on the field in UM-OSU, a game loaded with NFL prospects. Equipped with three picks in the first two rounds of the 2019 NFL Draft, its hard to imagine Kansas City not improving their secondary here. The unit still misses Marcus Peters, and longtime safety Eric Berry is not getting any younger. Taylor Rapp plays like a younger Berry, with a fearless, ball-hawking attitude. Jared Goff has an incredibly bright future and could soon be vying for MVP awards. Yet, in order to do that he will have to stay healthy and stay upright, which is where the O-Line comes in. West Virginia product Yodney Cajuste would've been a high pick a year ago but instead opted to finish his career with the Mountaineers. He has the talent to develop into a franchise left tackle to pair with Goff.